EU Security and Justice Law. The coming into force of the Lisbon Treaty has provided the EU with new powers in the fields of criminal law and security law while reinforcing existing powers in immigration and asylum law. The Stockholm Programme is the latest framework for EU action in the field of justice and home affairs. It includes a range of new legislation in the fields of immigration and asylum, substantive criminal law, criminal procedure and co-operation between national criminal justice systems. The combination of the new treaty and programme have made security and justice key areas of legislative growth in the EU. 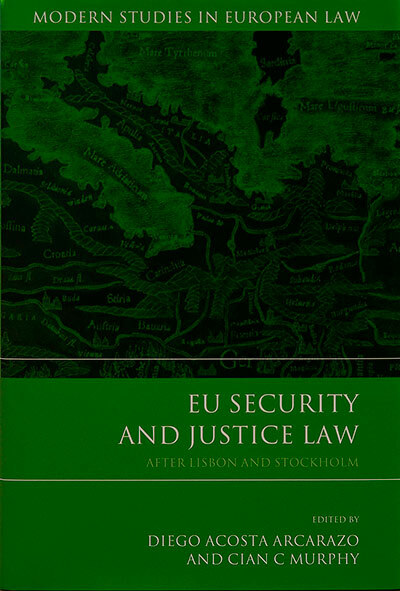 This volume brings together a range of leading scholars, as well as some of the most interesting new voices in the debate, to examine the state of EU security and justice law after the Lisbon Treaty and the Stockholm Programme. It provides a critical examination of EU law in the fields of immigration, asylum, counter-terrorism, citizenship, fundamental rights and external relations. The book also examines the evolving roles of the EU institutions and criminal justice agencies. It provides a critical account of EU law in this field under the developing constitutional and institutional settlement. Basilien-Gainche, RTDeur, Janvier-mars (2015), pp. ii-iii. Christopher Harding, International Journal of Refugee Law, 28 (2016), pp. 166-168. Rethinking Europe’s Freedom, Security and Justice. Download here. Justice and Home Affairs Law since the Treaty of Lisbon: A Fairy-Tale Ending? EU Migration Law: The Opportunities and Challenges Ahead. Download here.